Two UC Berkeley alumni, both national leaders in their fields — one in fighting poverty, the other in battling disease — are among the 23 Americans named Tuesday as recipients of coveted MacArthur Fellowships. 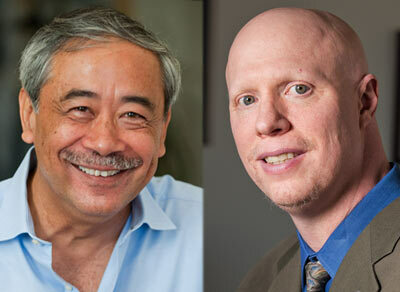 Maurice Lim Miller and Eric Coleman, Berkeley alumni who won 2012 MacArthur Fellowships. Maurice Lim Miller of Oakland, who earned his B.S. in 1968 and his M.A. in 1977 at Berkeley, was honored as “a leader in the development of services and systems designed to break the cycle of economic dependency for low-income families across the United States,” according to the MacArthur Foundation, which grants the fellowships annually. After two decades with the community development agency Asian Neighborhood Design in San Francisco, he founded the Family Independence Initiative in Oakland in 2001 with the goal of helping low-income working families help themselves out of poverty. His program has become a national model, according to a MacArthur Foundation account of his accomplishments. After graduating from UC Davis, Eric Coleman earned master’s in public health at Berkeley in 1991 and his M.D. at UCSF a year later. As a professor of medicine and head of the Division of Health Care Policy and Research at the University of Colorado at Denver, he has established himself as a leader in geriatric and chronic disease care. He has focused on a problem in American health care that has been largely ignored: the miscommunications and errors that often occur as patients move out of hospitals to other kinds of care, according to biographical materials on the MacArthur Foundation website. Systems developed by Coleman to address such problems have “the potential to improve substantially the care and health outcomes of millions of older adults,” according to his citation. MacArthur fellows are selected for their creativity, originality and potential to make important contributions in the future, according to the foundation. Each MacArthur fellow receives a no-strings-attached $500,000 grant over the next five years. More information about Maurice Lim Miller and a video are available here. More information about Eric Coleman and a video are available here. Complete information about the 2012 MacArthur fellows is posted here.